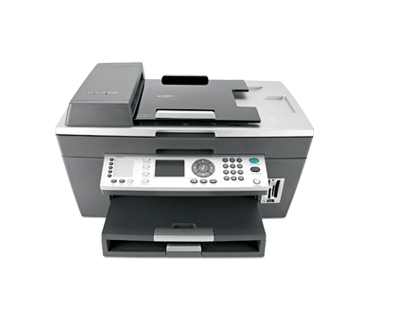 The Lexmark X8350 provides print, copy, scan and fax functions. Preview and print photos from a memory card, camera or USB Flash drive via the PictBridge Certified USB port. Quickly view, edit (crop, rotate, resize, remove 'red-eye') and print photos without a PC from your digital camera memory card; or from a USB flash drive or digital camera using the PictBridge Certified Port. 89 speed dials and 10 groups with 30 numbers per group, 5 quick dial buttons, Caller ID and distinctive ring detection (where available) Adjustable ringer volume, Call Waiting Disable Capability (receive and send), Automatic Redial / Busy Redial (where available), Confirmation, error and activity reports, Broadcast transmission and delayed transmission, Junk fax block (where available). Auto Answer Button, Scan before dial (default), Fit to Page, Fax footer, 160 page memory (at standard resolution) per T.24 ITU recommendation. Fax Forwarding, Fax Forwarding & Print, BVRP Host Fax Solution, Print-to-Fax via Lexmark N4000e or N4050e print server with send only. Print, Copy, Scan, Fax, reduce and enlarge photos and documents. Share your scanned documents or photos by email or easily print them. A 2.36" (60mm) color screen and 4" x 6" photo scan guides make placement and previewing of photos easy. The Countdown timer tracks printing progress. The exclusive Lexmark Photo Editor Software enhances photos. A4, L, Letter, 2L, 4" x 6", B5, 89 x 127 mm, 13 x 18 cm, Legal, A6, Hagaki 카드, 10 x 15 cm, A5, 5" x 7"
인치 - H x W x D): 21.6 x 15.5 x 17.6 in.